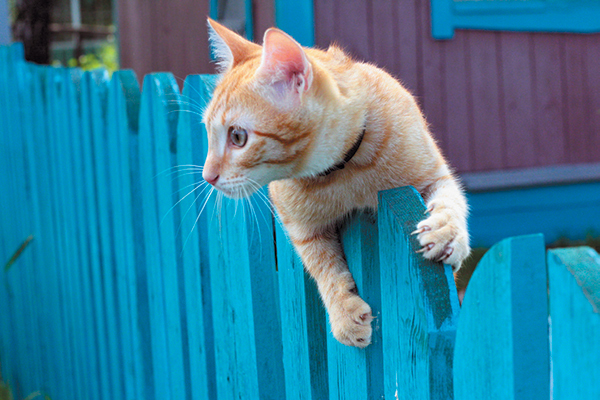 We've dug up nine things that could hurt or kill your cat — plus tips to protect him from harm. The origins of the famous proverb, “Curiosity killed the cat,” is debated, but its meaning is universally understood. Cats are known for their curiosity, which is a hallmark of their intelligence. Curiosity shows the desire and the ability to learn, but it also can get cats into trouble, or even kill a cat. 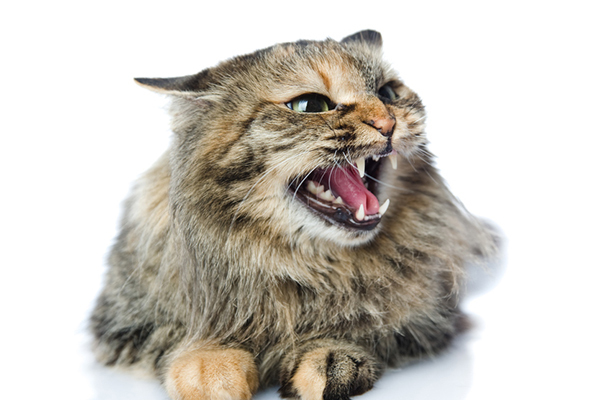 Here are nine common things that could hurt or kill your cat, along with tips to protect your cat from them. A brown cat with his ears back, hissing and looking angry. Photography by photodeti/Thinkstock. 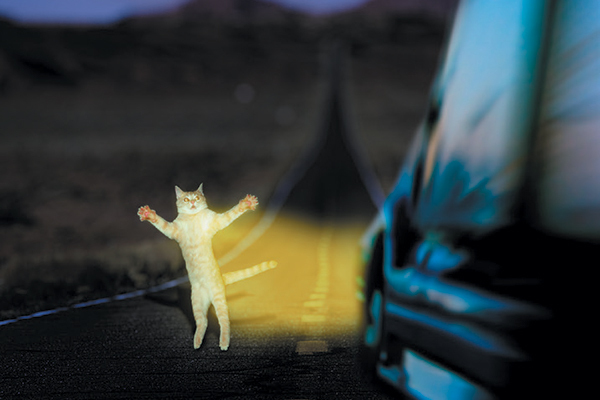 Cats’ urge to mate compels them to do reckless things, like darting into traffic or trying to escape from their home. Spaying or neutering not only prevents overpopulation, it also makes cats safer and happier in their homes. “They get into fights with other cats if they haven’t been spayed or neutered,” says Sharon Eisen, D.V.M., owner of The Complete Cat Veterinary Clinic, an all-feline exclusive hospital in Brookfield, Connecticut. Simply getting cats fixed will make them less likely to want to go out, she says, which leads me to my next point. A cat on the road. Photography by Andriikobryn/Thinkstock. “Microchip your cat, because if they’re going outside and they get lost and are not able to find their way home, hopefully a good person will bring them somewhere and they find you,” Dr. Eisen says. Keep their vaccinations up-to-date in case they do get out, she adds. Rather than let your cat outdoors, make an enclosure so the cat gets a sense of being outside without all the dangers, Dr. Eisen suggests. You can also make the indoors so much fun that your cat loses interest in going outside. Bite wounds that become abscessed are among the most common cat injuries that Pets Best Insurance and Cleveland, Ohio-based Embrace Pet Insurance process. 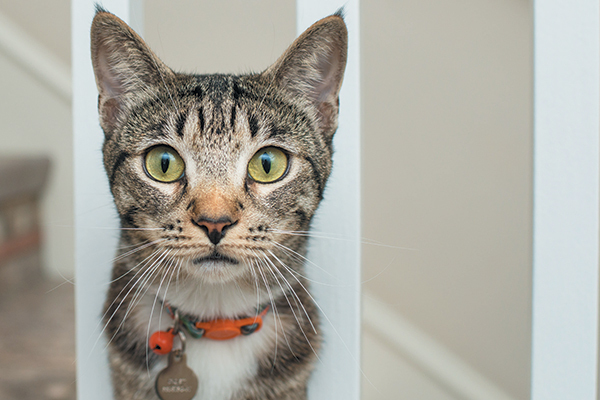 “The most common outdoor injury/accident is for sure cat bites/abscessed wounds,” says Embrace Pet Insurance Claims Manager, Jenna Mahan. Usually these injuries are the result of fighting. To prevent these types of injuries, Mahan suggests keeping cats indoors. But even indoor cats can sustain these types of injuries. Sometimes Dr. Eisen treats bite wounds or lacerations from cats in multiple-cat homes. “Make sure cats who cohabitate get along well,” she says. She recommends creating a less stressed environment for them. “There are products to calm them down,” she says, including foods, supplements and a synthetic pheromone product like Feliway. A gray and white kitten with string. Photography by SilverV/Thinkstock. Cats find string and other small objects irresistible. They bat them around, which is fine as long as they don’t try to eat them. 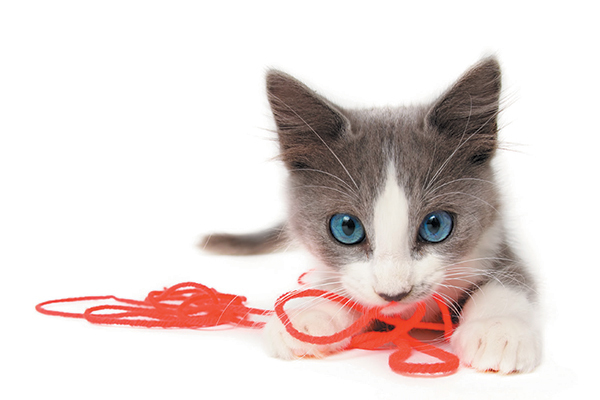 Keep string-type toys away from your cats when you are not playing with them. And keep used dental floss in a closed trash container. The most common claim Embrace Pet Insurance sees is foreign material ingestion. String and other small objects can cause an obstruction that could be fatal if the cat doesn’t receive prompt surgery. “Sometimes cats will present with a fever caused by a foreign body that they swallowed,” says Embrace Veterinary Marketing Manager, Dawn Pyne. If you see these symptoms, take your cat to the vet right away for further evaluation. 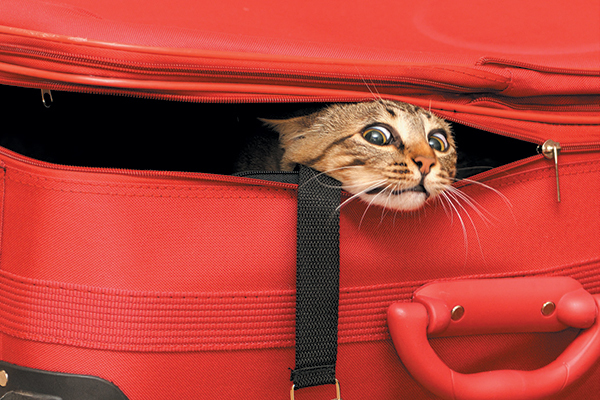 A brown cat stuck inside a suitcase. Photography by SERGHEI VELUSCEAC/THINKSTOCK. Cats cannot stand a closed door. Their curiosity will lead them into closets, cabinets, appliances and tight places where they can become stuck or trapped. Even little cubbyholes formed by an open reclining chair are too alluring for a cat to ignore. So before closing a closet, cabinet, dryer door or reclining chair, make sure you know where your cats are, so they don’t get hurt or trapped. A candle’s dancing flame tempts cats to swat at it or rub their faces on it. Dr. Eisen sees a lot of paw pad and face burns from candles and stovetop burners. Keep candles out of reach of your cats, or use flameless candles. Also, cover any stovetop burners until they are completely cool. A tabby cat on a staircase ledge. Photography by Casey Elise Photography. If you have a house with an indoor balcony or staircase with a ledge, cats can suffer broken bones from falling. “Most of the time I see that is with kittens exploring for the first time, and their bones are not yet set,” Dr. Eisen says. Don’t allow young kittens to explore an area where they might fall until they’re adults and steady on their feet, she recommends. If you live in a high-rise, keep secure screens on the windows, so your cat won’t fall out. If you drop a pill, whether prescription or over-the-counter, immediately find it and pick it up. Human medications at human dosages can be lethal to a cat. If you spill liquid medication, clean it up, so your cats don’t walk through it and lick it off of their paws when they clean themselves. Certain plants are also toxic to cats. Become familiar with the ASPCA’s list of toxic plants. Lilies, for example, are especially lethal to cats. Dr. Eisen sees poisonings from toxic plants and other household substances, such as insecticides and rat poisoning. Keep household chemicals locked up in a cabinet or part of the house where your cat cannot go. We all need a little help sometimes from hidden, unsuspected dangers. Sometimes our own blind spots lead us into trouble. Like us, our cats could use a little protection from a wise friend. Although Pets Best Insurance receives far more cat illness claims than injuries, based on claims submitted to the insurance provider from September 2005 to April 2016, the top three accident claims for cats are below, along with the common causes of those claims. Trauma: This includes general trauma to a cat from an accident and can include getting hit by a car or injuries from jumping off something that was too high. Bite wound: This often is the result of a fight. Of Embrace Pet Insurance’s 20,000 cat policies, these were the most common accident-related cat insurance claims from November 2016 through May 2017. Thumbnail: Photography by Belovodchenko Anoton/Thinkstock. Susan Logan-McCracken and her husband, Mark, share their Southern California home with two curious 9-year-old red tabbies, Madison and Sophie. My cats mouth on the inside is colored black so there is no way for me to check the color of his gums. Any suggestions. Please bring your cat to the vet if you are concerned.